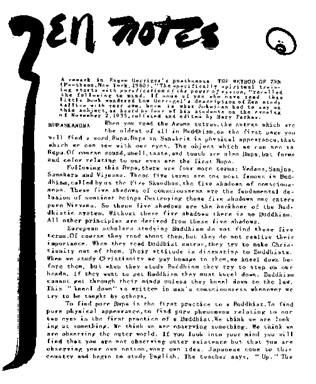 Sesshin -- Our first Rohatsu Sesshin with Isshu Miura Roshi, December 1-7, 1959. 19 persons admitted to the Sangha on December 8, 1959. The Four Vows -- translation and calligraphy by Isshu Miura. Isshu Miura's account as jikijitsu of Mrs. Ruth F. Sasaki's sitting through a Rohatsu Sesshin at Nanzen-ji in 1933. Mrs. Sasaki sat well. The Venerable Hsu Yun Passes away. 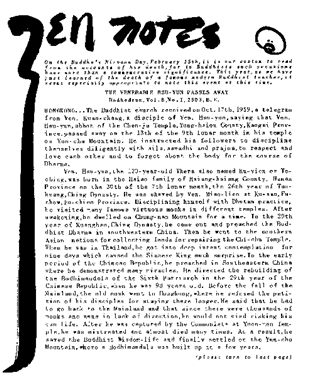 Hsu Yun dies at 120 years of age at his temple on Yun-chu mountain. He was the most famous and reveared of modern Chinese Chan masters. Hsu Yun Obituary, by Charles Luk -- including Hsu Yun's death poem. Letter From Kyoto -- Mrs. Sasaki's review of The Practice of Zen, by Chang Chen-chi. 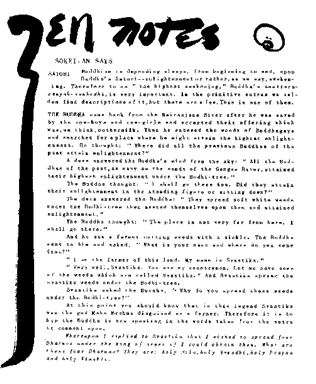 Buddhism Today -- Rev. Sheu Yuen, famous Dhyana teacher died and in his cremation left many pearl-like and jewel-like relics. Sokei-an Says: The dying moment is of great significance. Sokei-an Says: Satori -- Discussion of the Buddha's return from the Nairanjana River, his awakening under the Bodhi tree, and the four dharmas: Sila, Samadhi, Prajna and Vimukti; also the four stages of dhyana. 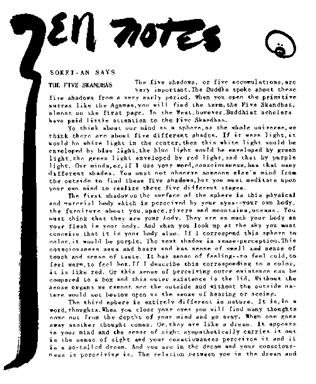 The Zen Eye on the Agamas -- "I wished to spread four dharmas under the king of trees...."
Sokei-an Says: Lumbini. The Buddha's birth legend, from the Samyukta Agama, also with references to Hakuin's sound of one hand and Gutei's finger. 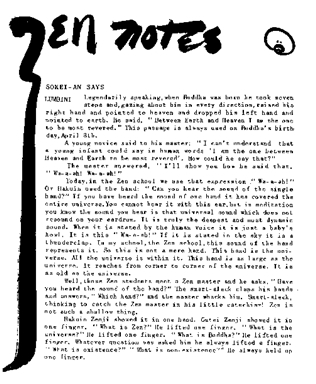 Letter from Kyoto: The story of Gary Snyder's Zen Buddhist wedding to Joanne Kyger, performed by Oda Roshi, then Kancho of Daitoku-ji. The Zen Eye on the Agamas: King Asoka protects India from Alexander the Great, and then sets out to venerate all of the Buddhist holy places throughout India, including Lumbini. Rupaskandha -- From the Agamas, the oldest sutras in Buddhism, five skandhas: Rupa "form", Vedana "perception", Samjna "thoughts", Samskara "deeper than thoughts" and Vijnana "consciousness". The story of the fisherman with the straight needle who catches the emperor is included here as well. 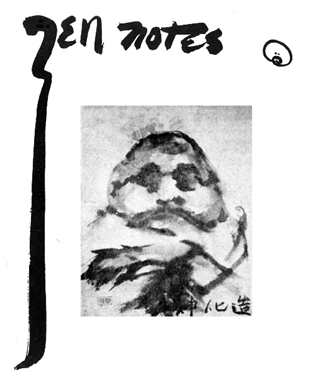 Letter from Kyoto -- Ruth F. Sasaki takes a train trip through China, with references to Manchukuo, the Shanghai Express, Peking, the Forbidden City, Son of Heaven, Tun Huang manuscripts, and a Kido roku poem. 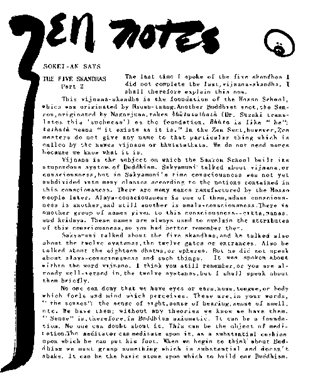 Good and Bad -- Sokei-an recounts his loss of $80 with the collapse of the Japanese-American bank, and the role of Mr. A.
Sokei-an Says: The Five Skandhas -- The five shades, or shadows, or spheres. Form, sense-perception, thoughts, seeds of thought, and pure consciousness are the five skandhas -- Rupa, Vedana, Samjna, Samskara and Vijnana. Sokei-an Says: The Five Skandhas, Part 2. The vijnana-skandha is the foundation of the Hosso School, originated by Hsuang-tsang. References inlcude Nagarjuna, bhutatathata, the Sanron school, twelve ayatanas, Yogacara school, Manas, citta, hridaya and alaya-consciousness. Poem by Rozan gaiju -- "A wild gust of wind..." translation and calligraphy by Ruth F. Sasaki. Romanization of Far Eastern names is difficult with the Varityper, since it lacks diacritical marks. Suggestions to resolve this problem are welcome. The Secular World, 1939. "Thus have I heard...." this brief sutra calls for using right-mindfulness to conquer secular desire and anxiety. Sokei-an Says: Koans are used in the Zen School to destroy secular ideas and emotions and desires. 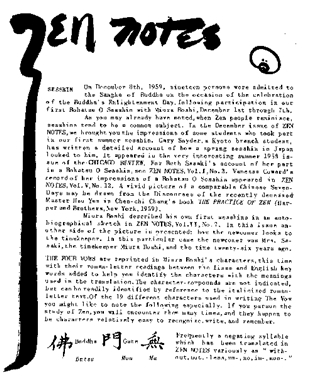 References to citta, manas, dharma, "Honrai no memmoku" and nirvana. Ruth F. Sasaki's audience with the Chinese emperor: Their discussion touched on Buddhism, Chinese sages, Zen meditaion, and the "Kingly Way" of Confucisn Teachings. 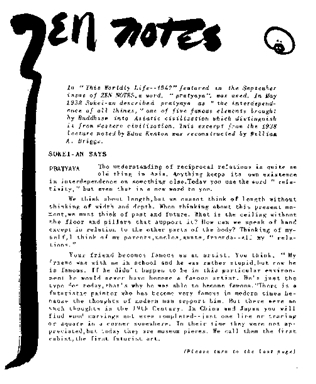 The account ends with a brief biographical sketch of Kung Tzu, or "Confucius." This Worldly Life, 1942. 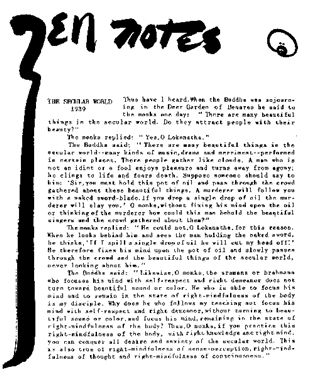 This is a follow-up lecture from that on "The Secular World 1939" from the last issue of Zen Notes. It touches on samadhi, smriti, the five skandhas, samjna, vedana, samskara, rupa, citta, and nirvana. Tenryu-ji "The Temple of the Heavenly Dragon" was founded by the Ashikaga Takauji, first of the Ashikaga shoguns, and is one of seven main Rinzai monasteries in Kyoto. The discussion touches on the Kamakura shogunate, emperor Go-Daigo, Muso Kokushi, lake Biwa, Ryosen-an, the Mumonkan and Zuiunken. Sokei-an Says: Pratyaya -- Reciprocal relations. Sokei-an planned to stay in Japan, but the Columbia River and the Rocky Mountains stuck in his mind, and he returned to America. 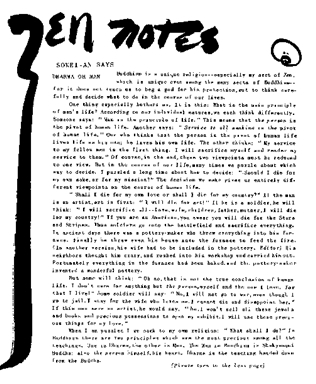 Outline of Buddhism 1937, Part One. This account of the Buddha's life includes a realistic assessment of the political state of the Kingdom of the Shakyas and its relationship to the powerful state of Magadha. It includes the story of the Slave Prince, and economic reasons as a powerful factor motivating monks to remain celibate. Sokei-an Says: Dharma or Man. What is the main principal of man's life? ...not the person, but your service is first. Buddhism 1937, Part Two. The Buddha's aceticism, meditation and enilghtenment; the beautiful daughters of Mara. The Metaphor of the Blind -- it is as hard for us to hear the real teaching of the Buddha as it is for the blind Tortoise to see the sunlight. Sokei-an Says: The Four Noble Convictions: Duhkha-Samudaya "The Cause of Agony," Duhkha "Agony," Duhkha-Nirodha "Cessation of Agony," and Marga-Nirodha-Duhkha "Way of Cessation of Agony." This lecture is an extended discussion of the Four Noble Truths. It also discusses the "Three Convictions" which the Buddha experienced before his final enlightenment: Changeableness, Emptiness and Non-Ego. Reconstructed by William Briggs. Cover: Ink Painting by Vanessa Coward.